Volunteering is for all and there is role for anyone who would like to get involved. Everyone can support organisations and the community they live in. ‘Inclusive Volunteering‘ is a resource developed to help volunteer coordinators to become more open and confident in embracing diversity. 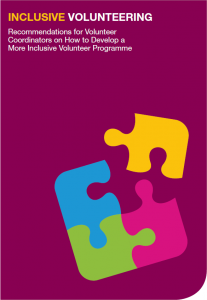 It contains clear recommendations on how to create a more inclusive volunteer programme. You will find useful advice on how to work with specific groups of volunteers and how to help organisations to welcome vulnerable volunteers. Part I covers general aspects of inclusive volunteering. Part II includes recommendations for volunteer coordinators on how to work with the following groups.